Barcelona’s The Hidden People will debut at ADE with a pop-up mini festival in a XVIII-century old chapel in the centre of Amsterdam at Hotel Arena. The intimate setting will host to 800 devoted party goers for for 12 hours of world class dance music. Headliners include Alex Niggemann, Baltra live, Breach, Butch, Detroit Swindle, DJ Boring, Object Blue live, Space Dimension Controller live and a very special guest, from Comatonse Recordings. Verknipt are set to serve up three days of the most essential parties at this year’s ADE. This will be their fourth annual showcase at the conference and once again they welcome acclaimed international house and techno DJs such as Ansome, Gary Beck, Anastasia Kristensen, Luke Slater, Sterac, Claptone, Dennis Cruz, Solardo, Guti, Franky Rizardo, SNTS, Dasha Rush and many more to Amsterdam studios. Each party features three arenas and killer lineups with a capacity for more than 2500 people. Verknipt is known for big productions with impressive lighting and laser shows, besides these events during ADE, they host parties all round the country having started six years ago. They also host their own big festival in the centre of Holland, which sold out this year, and have big plans for 2019 with even more, bigger events coming up. Things kick off with the first of two techno specials. The lineup includes Truncate, aka Ben Sims and Truncate, a pair of real techno legends, plus Soma artist Gary Beck, spectacular live shows from Ansome, Head Front Panel and Rebekah, plus more sets from Fatima Hajji, Anetha, Hotflush artist Sigha, and much more. The final day focuses on a rich array of house music and welcomes Dutch titan Benny Rodrigues, the mysterious masked man and deep groove shaman Claptone, infectious groove master and Moon Harbour boss Matthias Tanzmann, Sola label heads and vital tech figures Solardo, Solid Grooves founder Michael Bibi and associates like PAWSA, plus Suara's Spanish hitmaker Denis Cruz, a live set from the percussive, intricate groove man Guti and house masterclass from Defected and Rejected’s man of the moment Franky Rizardo. 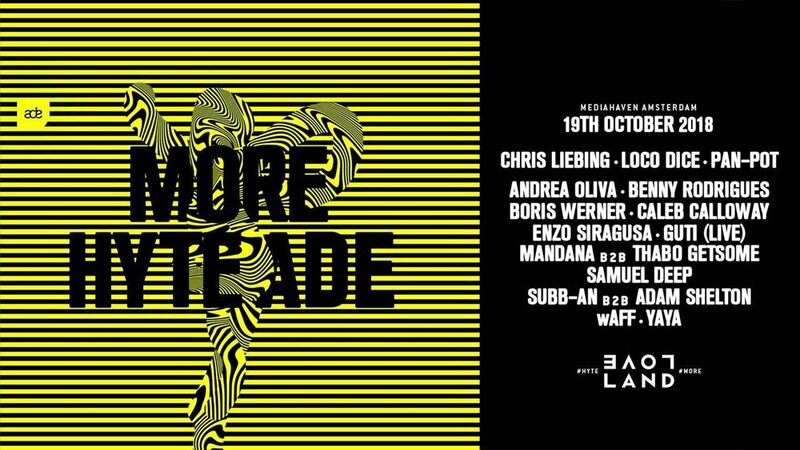 These three days are set to offer an extraordinary lineup of the worlds of house and techno in a perfectly immersive venue and will really raise the bar once again at this year’s ADE. 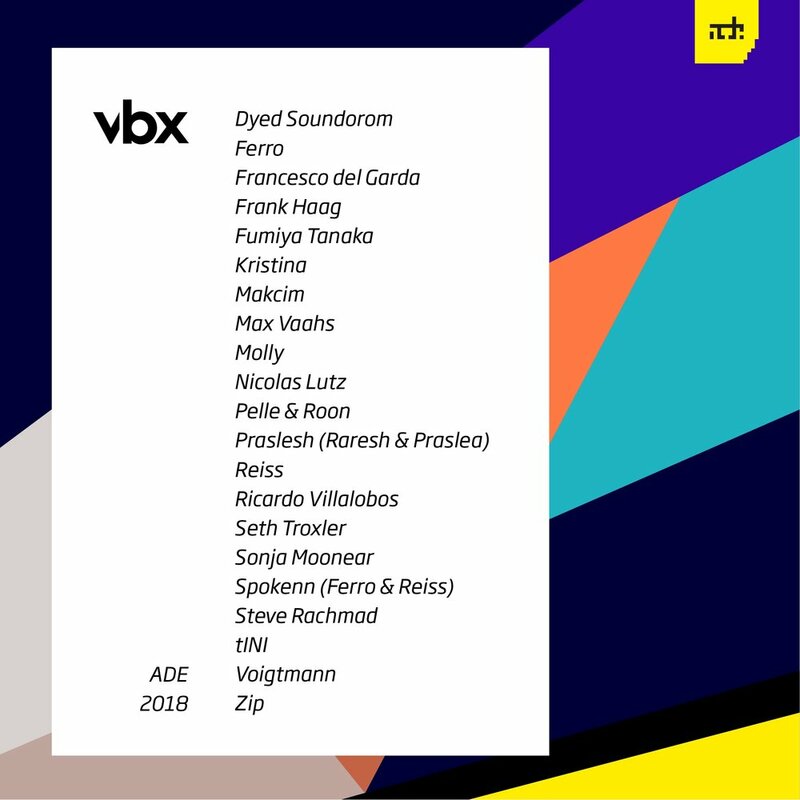 VBX is already making heads turn with the first announcement from their extra special ADE 2018 series, and now the esteemed promoters complete the line-ups for their four essential events with names like tINI & Molly, Makcim, Dyed Soundorom, Voigtmann, Praslesh, Francesco Del Garda, Fumiya Tanaka and more all playing various vital venues from 18th to 20th October. Everything starts on Thursday 18th at BRET with the trendsetting tINI & The Gang headed up by the boss herself along with Molly, who also brings some on point tech house vibes next to Moscow-born-Dutch resident Makcim who always fuels the party spirit with his intoxicating and powerful sets, mixing house and techno to create refreshingly deep grooves. Studio and DJ partnership Pelle & Roon also bring their expertly reduced minimal techno to make this a fantastic opening affair. On Friday, October, 19th at Warehouse Elementenstraat, the showcase with huge international talents such as Ricardo Villalobos, Seth Troxler, Zip, Sonja Moonear, Steve Rachmad, Nicolas Lutz and Spokenn (Ferro & Reiss) is the only place to be. On Saturday morning of October 20th, it is the annual ADE after-hours at BRET, when masters of groove like Frenchman Dyed Soundorom (best known for being one part of globe trotting DJ outfit and label bosses Apollonia) and minimal specialist and cult deep digging DJ Voigtmann. Also in on the action is Max Yaahs, a German who help runs the much loved HardWorkSoftDrink label, which is responsible for some of the slickest electronic house tunes of recent years, with Makcim and Reiss also playing to make sure you keep on dancing well into the daytime. Finally, it's to Shelter on Saturday 20th night for one big closing event with the legendary Romanian minimal pioneers Praslesh aka Raresh & Praslea who are real heroes that cook up stripped back grooves and atmospheric sound worlds. Francesco Del Garda, who mixes up UK garage, classic house, weird techno and slippery electro when in the booth also plays, and Japan’s revered Fumiya Tanaka brings his highly, simple but devastatingly effective techno with Ferro and Kristina closing things out. This is set to be a superb series of parties in some of Amsterdam’s finest settings, all with carefully programmed line-ups that perfectly compliment each other and make for unmissable action. On Thursday, October 18th, Free Your Mind Festival is presenting three label showcases in one single event at Amsterdam’s beloved Thuishaven terrain. Hernan Cattaneo’s label Sudbeat, Nick Warren’s The Soundgarden imprint, and Audiofly’s Flying Circus are joining forces for what promises to be nothing short of an electrifying ADE gathering. Expect to see many of the usual suspects on the date, which is part of Free Your Mind’s 15th anniversary festivities. For this label gathering this team presents some of the most established artists on the roster. Hernan Cattaneo and Nick Warren will once again be joining forces for an All Day Long B2B set and have invited a lot of the label regulars to join in for this celebration. Amongst the friends of Sudbeat and The Soundgarden you will find names as Nicolas Rada, Marcelo Vasami, Nick Varon and many more. The trademark warehouse will be filled with the absolute top of Flying Circus ambassadors featuring Blond:ish, Unders and FC’s very own Audiofly! Berlin’s globally renowned underground dance crew, HYTE is heading back to its spiritual homeland of Amsterdam Dance Event for one very special night on Friday, October 19, 2018. This annual happening is always a real showcase of HYTE’s core essentials. This outstanding music event will feature house and techno’s finest talents playing on three stages. The first announcement includes Loco Dice, Chris Liebing, Guti live, wAFF, Andrea Oliva, Adam Shelton b2b Subb-an, Benny Rodrigues, Samuel Deep and Mandana. This year HYTE moves into a new place for ADE, which is the fabulous Mediahaven. It will be turned into an electronic music lover’s haven by the quality production HYTE is so well-known for. HYTE’s event at ADE is a core part of the week-long conference since several years and always becomes one of the most talked about events. HYTE partnered up with Amsterdam’s finest promoter Loveland, to turn Mediahaven upside down. Attendees can expect even a music loving and friendly crowd, as well as next level production and immersive party atmospheres that will keep you dancing from 22:00 until well past dawn. Musically it is a real feast of quality from the world’s finest: New Mute Records artist Chris Liebing, who will release his first album this year after 10 years next to Desolat boss Loco Dice, who always make an impact with his bold drums. House heads crave the deep digging Dutch legend Benny Rodrigues. Watch out for a live show from the innovative Guti, whose next album is coming soon on Cuttin’ Headz, the label of The Martinez Brothers. Adam Shelton and Subb-an from One Records bring a UK flavour by teaming up for a back-to-back set, Ibiza regulars wAFF and Andrea Oliva will keep the crowds on their toes. Add in some hot emerging DJs, like Slapfunk´s Samuel Deep as well as Belgium’s rising Mandana and you have a mouth-watering line-up that offers something for everyone.